Porcelain? Stoneware? Earthenware? How do I choose? Today the choices for dinnerware can be daunting. Below we've put together the most frequently asked questions we get in our store helping customers select dinnerware. Porcelain is a vitreous ceramic material made by heating kaolin to temperatures between 2,200 and 2,600 °F. Porcelain has a stark white appearance with incredible durability. Porcelain dinnerware is dishwasher and microwave safe; and, some is even broiler safe. Hand washing is recommended for larger pieces, hand painted collections, or dinnerware with gold or platinum decoration. Items with metallic decoration are not microwave safe. See our Caskata and Pillivuyt collections for porcelain dinnerware. Stoneware is a vitreous or semi-vitreous ceramic made primarily from stoneware clay. Stoneware is fired at high temperatures. It is non-porous and so does not need a glaze. Stoneware is microwave, oven and freezer safe. 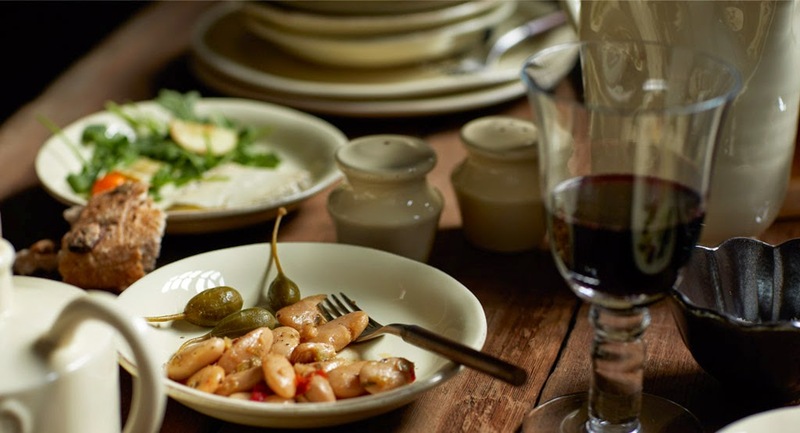 See our Casafina and Juliska collections for stoneware dinnerware. Earthenware is a clay fired at relatively low temperatures and is more porous and less translucent than porcelain. Typically, earthenware is relatively thick and heavy, and, depending on the clay used, its natural color ranges from buff to red. A well-known characteristic of earthenware is that it is likely to crackle. This crackling effect is considered part of its beauty but does not affect its use. Most earthenware is dishwasher safe on low heat settings. It is generally not microwave safe. See our Gien and Vietri Collections for earthenware dinnerware. Fine china generally tends to mean bone china which is a very fine, soft-paste clay that is made from several key ingredients, including bone ash. Considered by many to be the finest china available, it has great strength and chip-resistance. Bone china items may or may not be dishwasher and microwave safe. Fine china is more expensive than porcelain, stoneware, or earthenware and is considered to be formal china. What is a 5-piece place setting and do I want it? A 5-piece place setting includes a dinner plate, a salad plate, a bread plate, a cup and saucer. In today's fashion, must people are layering different dinnerware pieces together and the 5-piece place setting is not as popular as in the Downton Abbey era. If you do not do a lot of formal multi-course dinners, you may not need a 5-piece place setting. However, the bread plate doubles as an appetizer plate for cocktail parties. The salad plate doubles as a dessert plate, and the cup and saucer become part of a dessert buffet. Think about how you entertain to determine if you want 5-piece place settings. Depending on how you entertain, you may even need additional bread or salad plates. Today, casual dinnerware is more popular than ever. People tend to be more interested in dinnerware they can use in many different settings and layer with other dinnerware selections and/or fine china pieces. Casual dinnerware also costs less than fine china. Searching for dinnerware? See our recommended dinnerware collections.